Lets take a moment and go back to school and all get on the same page with our surfboard terminology. The guys at Next Level factory have put together this comprehensive guide to the different elements of a surfboard. Learning how a surfboard is built will enable you to get the board you want! As you know, surfboards come in all shapes and sizes, and some boards perform better for certain styles of surfing than others. Communication between the rider and the shaper regarding performance is crucial to the objective of getting the surfer what they want and need. Knowing the basic terminology with regard to the characteristics of shapes, foils, rockers, and surfaces greatly enhances this process. The selection of surfboard design is based on the surfers input. Factors to consider include the type of surfing to be done, and the size and type of waves to be surfed. The board parameters involved include the flotation requirements, overall width and thickness, and the width measurements at one foot down from the nose, and one foot up from the tail. Other considerations include minimum and maximum length limitations, as well as the overall width and thickness. In addition, there are deck and bottom contours, rocker considerations, and rail types to decide on. Along with these parameters, the surfer must also select the blank material and the type of glass job. Shortboards – The modern shortboard is typically under seven feet long and is made for aggressive surfing in critical sections of the wave. It is most commonly seen with sharp noses, thinner rails, and high rocker which produce high levels of maneuverability. Shortboards have evolved for use in competition by people all over the world. They can be ridden in waves from waist high to double overhead. Longboard – A classic longboard is the most traditional surfboard shape. Longboards were what surfers in Malibu, California & Waikiki, Hawaii originally rode in the 1950′s & 1960′s. They typically range from 8 feet to 12 feet in length. They are on average at least 2.5 inches thick & twenty inches wide. The fact that they are thicker allows them to paddle incredibly well. Someone learning to surf should start on a longboard shape to learn wave selection, paddling technique, and turning basics. Funboards – This term describes a larger surfboard shape with a lot of volume. Also called Mid-range boards or Mals.They range in length from 6 feet to 8 feet. The funboard is a great transitional board for anyone who wants to move down in size while still maintaining superior paddling power and stability. Because funboards are wider, they allow the rider to balance easily, which makes them fun to ride, especially for beginners. Outlines may also be referenced by the overall distribution and configuration of the surface area of the surfboard. Considering the surfboard’s outline from this perspective has significant impact on the design process and the performance of the surfboard. This perspective focuses on the fundamental and essential effect of the overall view of the outline on the design goals of the surfboard. Specific elements of the outline (nose and tail configurations and width throughout) are incorporated into the design to further develop and tune the surfboard’s outline. The logic is to begin with a fundamental design goal, basic, relevant, and essential, then tune that fundamental design with specific elements. Distinct overall outline configurations include dominantly “parallel” outlines, dominantly “continuous curve” outlines, and “hybrid” outlines (where parallel and continuous curves are integrated to mix and match their effects on the performance of the surfboard.) These overall outline descriptions, like the specific elements of the outline, are important design variables used to create, modify, and tune the performance of the surfboard. Surfers, and designers may prefer either of these approches or perspectives (or others) to initiate outline design. Arguably, though, initiating the outline’s design with relevant choices about performance based on the overall distribution and configuration of surface area then tuning the outline with specific elements ultimately yields a superior surfboard. A parallel shortboard, semi gun, tow board, hybrid, or longboard outline will have strong nearly straight curves in the template running “parallel” to the center line of the surfboard. These parallel lines dominate most of the length of the surfboard. They extend surface area further into the nose and tail of the surfboard. They can be very effective in creating a longer drawn out turn from a shortboard, small semi gun, or tow board when required by surfing conditions. Extreme parallel outlines can be problematic for shortboards. as they may lack the necessary curves required by a shortboard to turn and release in tight and critical as well as flat and soft sections of waves. Strategically placed parallel lines through the widepoint (near the surfer’s front foot) towards the fins (just forward of the surfer’s rear foot) matched with continuous curves near the rail fins provides the required release and tight radius a shortboard needs to profit from the speed and power provided by those parallel lines. Dominantly parallel outlines may be used in semi guns and hybrids where the length of the surfboard matched with the elongated straight curves yields a long powerful turning radius. The extra length of these surfboards remains an asset when, as with shortboards, the parallel areas of the template are matched with areas of continuous curve. Parallel outlines are very common to longboard templates. Classics, nose riders, and “pigs” have “parallel” lines dominating the nose and widepoint of their outlines. Their dominant parallel lines promote down the line trim and nose riding performing these tasks best when well positioned in the most critical parts of waves. Contemporary and performance longboards have strong parallel lines in the widepoint and midsection of their outlines carrying to a lesser degree into the nose and tail than they do in “old school” longboards. The shorter parallel lines matched with smooth sweeping curves into the nose and tail of the “new school” longboards creates an outline that has a unique combination of trim, nose riding, and turning potential. Continuous curve outlines feature smooth, geometric (nearly elliptical), constant curves in the plan shape or template. They are common to longer shortboards, semi guns, and hybrids where one of the fundamental design goals is an easier tighter turning radius turn from a surfboard whose extra length would otherwise result in the surfboardÕs performance being relatively “stiff.” Another common use of a continuous curve outline is matching it with a flatter more relaxed rocker profile in an average shortboards and hybrids. (When a flatter rocker profile is essential to the design goals of the surfboard or the preference of the surfer.) The curved outline matched with flatter rocker yields a surfboard that maintains acceleration and drive out of the turns and can still carve a very tight radius turn. One important property of a modern surfboard we often overlook is flex. This is now a hot topic in surfboard design. Surfers are starting to understand how surfboard flex affects our surfing and which design characteristics increase flex memory. Shapers everywhere are responding to this increased interest. Flex allows your surfboard to build energy through turns when the surfboard’s materials change shape. Picture this sequence: You drop into a fast, steep bottom turn. As you do so your surfboard’s foam will bend into the turn. This results in more rocker and stored energy. As you come out of this turn and aim for the lip the foam snaps back to its original shape, releasing the stored energy and shooting the surfer out of the turn. A seasoned surfer will turn this burst of energy into acceleration, propelling himself into the next maneuver. While the flex characteristics can help your surfing, creating a surfboard design with flex in mind presents challenges. First, the surfboard must walk the line between flex and strength. Secondly, after repeated compression and expansion, a surfboard’s traditional wood stringer will weaken, giving it a “dead” feeling. The recent emphasis on flex resulted in questions regarding stringer placement. A board with a center stringer will be stronger and less flexible along the center. However, its rails will flex and wobble which can cause the board to slow. This is called torsion flex. The closer the stringer is to the rail, the more strength or spring it will have along its perimeter which is where the board primarily makes contact with water in turns. It also supports the rail to maintain more of its original rocker shape while the flex comes from the center of the board. The deck is the top of the surfboard. The surfboard rails often impact the deck design. The most common are domed, flat, and step decks. Each has its own benefits, performance characteristics, and feel. A number of companies now offer soft top surfboards. These lower the chance of injury and are incredibly durable without sacrificing too much performance. Some other deck options are Concave. Concave decks lower your center of gravity. Getting you closer to the surface of the wave. Other options are a S-deck, these decks are not flat from tail moving towards nose area. These decks have what appears to be a “Hump” in the center. Scooped out in nose area and pulled down tail. The Surfboard Bottom Contour is easily one of the more complex and misunderstood concepts pertaining to surfboard design. Basically the bottom contour purpose is to influence the way the water (wave) flows beneath it. The contour will decide how fast or slow a surfboard goes and the ability to control and turn it. This was used on the first surfboards. It literally means flat, no contour whatsoever. Flat Bottoms are good for slow mushy waves and they respond well in these type of conditions, surf them in powerful or big waves and these will be difficult to control. Concave bottoms can have a “single” and/or “double” concave. A surfboard with a single concave will have 1 concave from rail to rail. The concept is that concave on the bottom of a surfboard will provide lift which facilitates water flow. A single concave is lowest at the stringer. Making for a straighter center line. It also makes the rail have more curve. This bottom contour works well in large clean surfing conditions. Double concave is just that, 2 sets of concave on a surfboard.The concept behind double concave is the double concave splits the water into two channels through the fins and creates a much looser ride—great for flowing maneuvers. Double concaves are one of the more popular bottom designs found on modern shortboards. Generally a surfboard will have a single concave at the nose and then turn into a double after the midpoint down towards the tail. Overall Vee makes a surfboard easier to surf rail to rail. This bottom contour works well in LARGE surf. The rocker is the bottom curve of the board from the nose to the tail. It is the curvature of the surfboard from a profile or side angle. The basic reason for this curve is to fit the surface area of the board to the curvature of a wave face. If your surfboard had a straight rocker, you are more likely to pearl when dropping into the steep part of the wave.The amount of curve in the rocker will affect the turning or carving ability of the board. Performance shortboards typically have more rocker to give a smaller turning radius. It is also more suitable for getting into steep and hollow waves. The nose rocker is curved near the front of the board. Similar to the front of a boat’s hull, this is designed to keep you from digging into the bumps of the wave. As a surfer drops into a wave, the curvature of the nose will help to keep the board on top of the wave’s surface. Otherwise, the board’s nose may dig into the water and pearl. This area at the top of the board (measured at a point twelve inches down from the tip) is more important than most people think. A thinner nose is almost always associated with a higher-performance surfboard geared toward larger waves and is accentuated with greater rocker. A wider nose can be found on beginner and small wave boards as its greater surface area on the bottom captures and channels more water through the wide point and tail of the surfboard. More foam usually means greater stability, but with the sacrifice of a bit less maneuverability. A wide point is the widest area across a surfboard and it is not always located in the center. Wide points vary and often “forward” wide points (pushed toward nose) aid front-footed surfing and “pulled-back” wide points (pushed toward tail) aid back-footed surfing. Generally, the wider the board is the more stable it is and the more suited it is for smaller surf and vice versa. To find the wide point on a surfboard simply take a ruler or measuring tape and stretch it across the deck, slide the ruler down perpendicular to the stringer until you find the area of the board that has the greatest width across. Like the fins, tail design is a highly argued yet innovation friendly aspect of a surfboard. To name all of the tail shapes that have passed before us since surfboard shaping went full throttle more than forty years ago would be exhausting. There are a few, however, that have come and stayed and will always remain. Squaretail, Swallowtail, Squashtail, Thumbtail, Rounded Pintail, Pintail, Battail, Diamond Tail, Double-wing swallow, Asymmetrical Tail and more i.e. This is the distance from the nose to the tip of your surfboard, measured along the stringer. Length is one the most important factors for a beginner when they are considering the right board to help them evolve into a better surfer. Longer is better so long as it correlates with a wider template and thicker rails. More foam floats better and leaves more room for error. Shorter is usually a realm best reserved for an intermediate to experienced surfer. For the intermediate to experienced surfer, everything we once believed about surfboard length is being tested and contradicted. Surfers are riding shorter, wider boards in consequential surf, contrary to previous big wave surfboard dimensions. For example, Kelly Slater won the 2008 Pipeline Masters surfing on a 5’10″. In response to the “5-8 is the new 6-2″ trend. Thickness is a very important feature that everyone-from beginner to experienced-needs to be aware of. It will determine in many ways how the other design features of your board will work. The thicker the board the more stable and buoyant it will be-obviously this is important for a beginner. But more technically, thickness can change in a surfboard’s template in countless different areas, all of which directly relate to stability and responsiveness. Fins have a huge impact on the feel, stability, drive and maneuverability of a surfboard – factors that can completely alter the way you experience surfing. This article provides some basic information on fins, from key terms and measurements to common setups, which will help you make educated fin-buying decisions. Single- A board that has one larger fin is usually meant for long, down the line waves and for flowing from rail to rail. Twin- A twin fin surfboard has two fins positioned a bit closer to the rail, resulting in a quicker, looser, faster turning board. Thruster- Three fins create more drive and stability, offering the ability to redirect on a dime. Quad- Instead of having a center fin there are two fins positioned on each side of the stringer, giving these boards a lot more speed without sacrificing much control.This setup is often used in short boards and provides more lift and control surface near the rail. There is no center fin. Five Fin- The boards equipped with five fin boxes gives the surfer the option to ride the board perfectly as a thruster or a quad for a very versatile surfing experience. Bonzer- The Bonzer is a 3- or 5- array invented by the Campbell brothers in Oxnard, California in the early 1970s for the powerful waves of a well-known wave near their home. The Bonzer array is an approximately 7″ center fin aft and either two or four delta-shaped fins (“runners”) mounted near the rails in somewhat similar fashion to other rail fins, but they are substantially lower aspect and aggressively canted outward. The Bonzer array is firmly held to be an integral part of the Campbell brothers’ overall board design featuring double concave bottom contours out the tail. Twinzer- The Twinzer is a design by Wil Jobson and similar to the Campbell brothers’ “Bonzer,” the fin set-up is held to be functionally integral and synergistic with the bottom contours of the board, specifically a “bat-tail” with an integral convex/double-channel. The fin set-up itself is four fins, two on each side, in a similar position to the rail fins on a thruster. The fronts are smaller than the rears, often roughly 1/3 the size, mounted ahead and outboard of the fronts, with ~8 degrees of outward cant, and notably, the fins’ trailing edges are behind the leading edges of the main fins. The water coming off the trailing edge of the “canards” becomes part of the flow “behind” the main fins. This fact is held to enhance the lift and speed of the set-up, because of the “slot effect.” The exact measurements and configuration of the twinzer are basically standardized by Jobson, but some variation is seen amongst different builders. The 2+1 denotes a larger center fin (for reference, larger than a thruster center fin) with 2 small to medium-small fins at a position close to thruster rail fin positions. The “sidebites” contribute some lift, control, and stability to the board when it is “on rail,” arcing through turns. Typically, “sidebites” are removable, so the surfer can take them out for use in smaller waves, which gives less drag and freer turning. The 2+1 is a popular configuration for mid length to long boards. The angle of the fin (box) in relation to the center stringer is known as a fin’s toe. Most side fins can be described as toe-in, meaning that the front of the fin is turned in closer to the stringer. Toe-in causes the water to pressure the outside of the fins, which in turn makes the board more responsive to rider input. The cant of a fin is the angle it makes in relation to the bottom of the surfboard. A fin that sticks straight up, perfectly perpendicular to the board’s base contour, is said to have a no cant. Canted fins point outwards, toward the rails of the board. Increasing the fins’ cant leads to a more responsive board through turns, while decreasing the cant (bringing it closer to 90°) makes the board faster, especially when traveling in a straight line. When you look at a surf fin, you’ll notice that it is shaped in an aerodynamic fashion from its front edge to the backside. Most often, the thickest portion of the fin is the in the middle, while the thinnest part is the outer edges. This shape is known as the fin’s foil, and it has a big impact on the way the water flows under the board. Some fins are flat on one side and foiled on the other (usually side fins), while others are foiled on either side (single/center fins). The idea is to create lift under the surfboard and help propel it most effectively in different wave conditions. The more pronounced the foil, the more lift it will provide. Unfortunately, this also causes more drag on the board, which slows it down. The rake measures how far back the fin curves in relation to its base. To find a fin’s rake, imagine a flat line continuing out from the base of the fin; next imagine a line that extends from the back of the fin base to the very tip of the fin. The angle that these two lines form where they intersect at the back of the fin base is the rake. The smaller the angle, the farther back the fin tip reaches (a larger offset from the base). Fins with a small rake/large offset will propel the board faster and remain fairly stable, but there is a sacrifice in turnability. Fins with a large rake/small offset give the surfboard a tighter turning radius, but don’t offer as much stability. As usual, you’ll need to strike an effective balance determined by the type of waves you ride and the style of board you have. The flex or stiffness of a fin plays a big part in the way a surfboard will ultimately handle on the water. If you are a beginner, stiff fins are more forgiving and will give you the stability you need, so you might start there. Their lack of flex makes it hard to make sharp turns, and the turns you do make will be wide and sweeping. However, a stiff fin has the tendency to revert quickly to its natural position, so the turns will be faster than with a flexy fin.Flexible fins add a level of feel to the board that is hard to match with their stiffer counterparts. They are slower to reach their maximum flex, meaning the board continues to respond to the rider’s input throughout a turn. This can cause some problems for new surfers, as it makes the board more difficult to control. This measures what is usually the widest point of the fin’s outline – the base. The base length impacts the way that a board will turn and drive (accelerate through turns). A longer base provides more surface area to push against the water, so turns are stronger and drive is increased. However, the larger base doesn’t permit the board to turn sharply, so if that’s what you’re after, go for a fin with a shorter base length. The depth of a fin is basically how far it sticks into the water, measured from the bottom of the surfboard to the tallest point on the fin. Depth affects the way a board will grip the water through turns, and it determines how well the board remains stable. The taller the fin, the more hold it will have in the water, providing the rider more control. While shorter fins don’t grip the water as well, they do allow the board to slide-out a little, which some surfers enjoy. This is that strip of wood you see running down the middle of your surfboard. It provides strength and a center for “flex” in your board. Often times the stringer is made out of balsa wood, but other stronger woods and materials may be used as substitution. Wood, foam, plastic, or reinforced plastic element glued into the center of a blank on a vertical axis. Stringers provide a crucial “I-beam” element to the “core” of a “foam sandwich.” They reinforce the ultimate strength of a surfboard by holding the top and bottom “skins” of the”foam sandwich” apart. Some boards, usually for bigger waves, are equipped with more than one stringer for extra strength. Many boards on this site have examples of alternative stringers such as Agave cactus and various hardwoods. Other stringer designs are being used as well, for example, the parabolic stringer does not feature a stringer running down the center of the board, but rather two on the rails to create a unique liveliness and flex for an unparalleled surfing experience. Polyester Resins are styrene based products used in surfboard and general fibreglass construction. Commonly referred to as fiberglass resin or boat resin. Polyester Resin is an economical alternative to using epoxy resins. Polyester resins must be used when using Polyurethane Foam. Epoxy Resins are a two-part resin system used for low shrinkage, low brittleness high strength applications. Epoxy Resin will outperform most polyester resins but it is a more expensive alternative. Epoxy Resins must be used when using EPS Foam. And can be used on Polyurethane Foam. Fiberglass cloth along with resin (the hardener) is the shell on your traditional board. In both instances fiberglass is used along with as the structural strengthener of that shell. On a polyurethane shortboard, the accepted choice of cloth “weight” is a 4 and 6 ounce combo on the deck with a 4 ounce bottom. Longboards are heavier; usually with 4/6 ounce decks and 6 ounce bottoms. There are two widely used types of fiberglass for the traditional polyurethane surfboard. “E” cloth is the most commonly used of the two. “S” glass is stronger but more expensive. You can use a combination of the two if you choose, but this is a custom touch and you must request it. Surfboards are usually constructed using polyurethane foam. They are made stronger with one or more small pieces of wood, called a stringer, going down the middle of the board. The foam is molded into a “blank”, in the rough shape of a surfboard. Once the blanks have been made they are given to shapers. Shapers then cut, plane, and sand the board to its specifications. Finally, the board is covered in one or more layers of fibreglass cloth and resin. It is during this stage that the fins, or boxes for removable fins, are put on and the leash plug is installed. Another method of making boards is using epoxy resin and prolapse polystyrene foam, instead of polyester resin and polyurethane foam. In recent years, surfboards made out of balsa and a polystyrene core are becoming more popular. Even solid balsa surfboards are available. Although foam boards are usually shaped by hand, the use of machines to shape them has become more popular over the years. Modern technology has made its way into surfboard production as well. Vacuum forming and modern sandwich construction techniques borrowed from other industries have become more common in the industry. Many surfers have switched to riding sandwich-construction, epoxy boards. These boards have become especially popular with beginner surfers as they provide, in most cases, a cheaper entry-level surfboard as well as a more durable and resistant one. The history of using balsa as a material for surfboard making goes back to the Hawaiians, but became more popular in the late 1940s. Being light and strong, balsa wood was long considered a perfect material for surfboards. Shapers could not use this fragile wood to make entire surfboards until after WWII, when fiberglass was invented. Balsa wood boards are lighter, more buoyant and easier to handle. These boards have some disadvantages; they are not as sturdy as solid redwood boards. 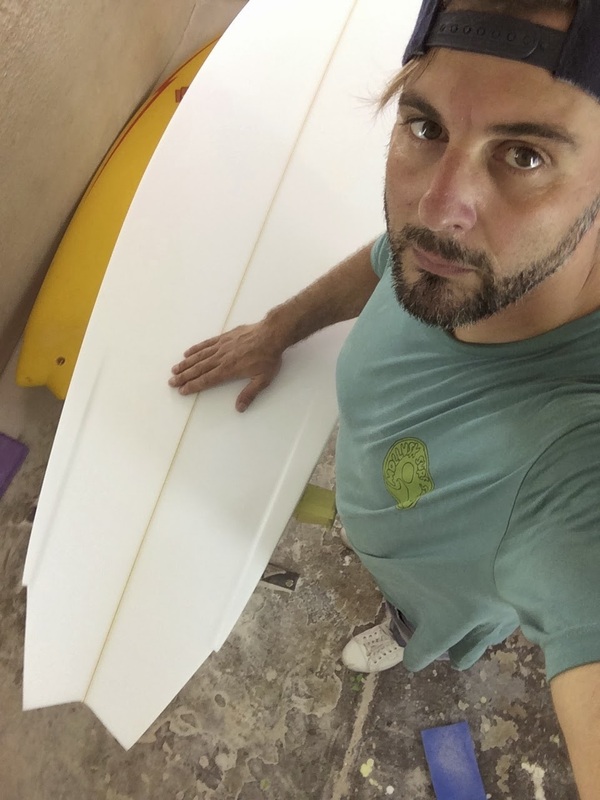 They are currently favoured by surfers and collectors because they are more durable than a regular surfboard, environmentally friendly and have a beautiful appearance. The difference between PU and EPS. The closure of Clark foam was a double edged sword. Clark had a formula that was designed for close tolerance blanks. The outer shell was the hardest foam, and the density dropped off towards the interior of the blank. OK for hand shaping. Not so good for machine shaping. “Over shaping” would compromise the durability of the core. Today there are several PU foams available that are an improvement over the foam most of us used almost exclusively for decades. Lighter, tighter, whiter, and fairly even density into the core. Eps material has been around since the 50′s. Eps for surfboards came from large blocks of partially fused beads , primarily used for insulation and packaging. Hence the beer-cooler reference. The blocks of foam were something on the order of 3’by 4’ by 12’. Blanks were cut from the big blocks with a hot wire. EPS must be glassed with epoxy. Early epoxies got a bad rap for being highly toxic if not handled right. They were also not very clear and tended to be more on the yellow or light brown side of things. In the early 80′s a handful of board builders revisited eps. The foam hadn’t really changed much. There was a lot of interest in EPS/Epoxy construction for sailboards. The strength to weight advantages were obvious in these larger watercraft. It became the go to construction for most of the custom sailboard builders. This know-how trickled into the surfboard world. The ASP tour actually had an event in 1985 that was held in a wave pool in Allentown, Pa. Tom Carroll won the event. Quite a few pros ordered up lightweight epoxy boards for this fresh water event. Now we are using surfboard specific eps foam. It is highly fused and has a much smaller bead size than the foams that were experimented with by earlier generations of board builders. 2 boards of equal volume and area, if one is lighter, that is basically your gain. With EPS cores it usually works out to a 10 to 15% difference. and feels much livelier when surfed. Eps foam requires glassing with epoxy resin. Epoxies are much more durable than polyester resin. They also come in a variety of flex matrices and the combination creates a very durable, light weight surfboard. PU is considered an open cell foam (counterintuitive) and is basically a plastic foam filled with irregular gas bubbles. When a PU core is expose to water, it takes a while to migrate and over time the foam will also deteriorate. EPS is considered an open cell foam…think many tiny ping-pong balls stuck together. The trick is to compress and fuse the little beads together so water doesn’t have the ability to migrate freely. PU can be glassed with either polyester resin or epoxy. In fact, PU with an epoxy glass job is a much more durable alternative to the poly. EPS must be glassed with epoxy. With EPS/epoxy boards, small dings where there isn’t too much of the core material exposed, it is ok to use a quick acting UV cure poly. Solarez does make a UV “Epoxy”. For larger wounds, you need to use epoxy. Polyester resin will melt the EPS foam. Yes if left unrepaired, it will take in LOTS of water. The ding repair guys love this. They often drain water for days. EPS foam glassed with epoxy resin is not stiff. If anything, all else being equal, it will be more sensitive and have quicker springback than a PU/PE board. In fact, because of the lightness/buoyancy you can go thinner if you choose, which will make the board feel more alive. Epoxies also come in a variety of flex matrices and the potential to tailor flex to personal taste is wide open. Certain types of molded EPS/epoxy boards have a layer of high density sheet foam sandwiched between the core, cloth, and resin. This is what causes those types of molded board to be “stiff” feeling.When deciding on which core material to use, consider your local conditions. In everyday surf, smaller weaker waves, light wind, the lightness and liveliness of EPS/Epoxy should be a no-brainer. Why don’t you see more EPS in the stores? Cost: Part of it is price point. The cores don’t differ much in price. It’s the epoxy resin that is more expensive and through-put time also affects cost…it’s a little harder to work with and takes longer to go through the factory than PU/Poly. Mythpercetion: the surf media perpetuates the notion that the tour pros don’t ride EPS/epoxy. What the media usually forgets to mention is that the pros do have unlimited access to very light, very fragile, PU/PE boards. To weigh in at about 5lbs, a PU core needs to be glassed with single 4ounce cloth, top and bottom, with maybe a 4oz tail patch. Good for anywhere between 2 to 20 sessions. A 2 lb EPS core can be glassed double 6oz top and single 6oz bottom and still come in at close to 5lbs and have a much longer lifespan than a comparable pu/pe board. Some of our team riders do use EPS, especially for smaller, weaker surf. A majority of Kelly’s boards are EPS.